Shell crochet stitch is quit traditional stitch in crocheting. Many crocheters like to use it for their projects. 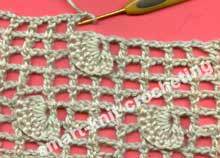 It is easy to crochet and together with other crochet stitches provides a lot of variants for creating attractive crochet patterns. Recently I've found another approach to this traditional stitch. Shell stitch was used as a decorative element for the filet crochet mesh. A talented Ukrainian designer Svetlana Lebedeva suggested a few unusual modifications of this traditional stitch. Shell stitch she uses as a decorative 3-D element for the plane filet crochet mesh. There are only two elements in the pattern she introduced. But there are no limits for the creative master imagination. to make the pattern even more decorative, shells are crocheted in a different color than the mesh itself. Lets consider the simplest variant of Svetlana's approach to decorating filet crochet mesh with shell stitch. 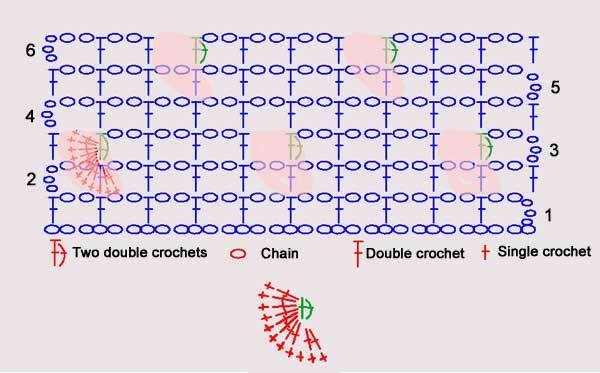 Each cell of the mesh consists of double crochet, chain 2, double crochet, (dc, ch2, dc). Each decorative shell consists of TWO ROWS. A graphical chart for a shell stitch is presented in the very last cell of the table below. Follow the steps in a table to make a shell. Each decorating shell is based on the loop created by two double crochets. At the cell where you plan to crochet shell stitch, crochet 2dc instead of dc. Now your cell looks like (dc, ch2, 2dc) while adjacent sells are crocheted like (dc, ch2, dc). Turn your work 90 degrees clockwise. Arrow shows direction of crocheting. 1-st Row. Crochet eight double crochets (8dc) into the loop of 2dc. 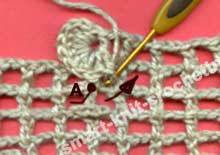 Fasten a shell to a filet crochet mesh by one single crochet (sc) at point "A". (Row of cells below). Turn you work 180 degrees. Passing point "A", crochet two more double crochets (2dc) into the loop of 2dc. Begin 2nd row of the sell stitch. 2-nd Row. Turn you work 180 degrees. Watch direction of the arrow. Crochet ten single crochets (10sc) into double crochets (dc) of the first row of the shell stitch. At the end of the row join a shell to a filet crochet mesh (Point A) by one double crochet (dc). A filet crochet mesh decorated with shell stitches looks great as a crochet fabric itself or as an edging. Its attractive 3-D structure will decorate perfectly detail of a dress: collars, sleeves, pockets, and so on. Home › Filet Crochet › Filet Crochet Patterns. Part 4.